The way this course is structured and taught, using the person-centred approach, is definitely what differentiates it from other NLP training schools. I began my studies with the Salus Academy in June 2015 and qualified in September 2016 as a Person-Centred Integrative NLP practitioner and Hypnotherapist. 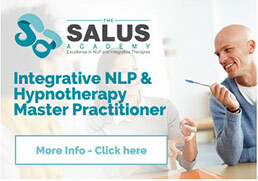 There are many NLP and Hypnotherapy courses available, but unlike many ‘quick-fix’ NLP courses, which take place over a week, the training Peggy provides at The Salus Academy takes place over 6 months, with 6 further months of supervision. This gives much more time and space for students to really develop their practice and learning. The requirements to qualify are very well structured, with clear instructions and a lot of practice with real clients. Looking to the client as a whole human being rather than focusing only on the issue they are bringing to a session is invaluable, and ensures students develop a much more holistic, skilled and effective way of working with their clients. Since qualifying I have helped many people with light traumas, phobias, some mental health issues, a lack of confidence, public speaking issues and many more challenges. I am very thankful to Peggy for her knowledge, professionalism and experience, and for all the support and close assistance she provided throughout the course.